Wow, I can't believe people still go to this site, I am very grateful. I still want to do something with this site but I honestly have not had the time. If anybody does have the time to do something on this site with me, please send me an e-mail to tigurius [a t] gmail [d0t] com. Added a new Tech Section, this section is being looked after by Jerry "Kan Man" K. A certified tech from No Show Paintball LTD. 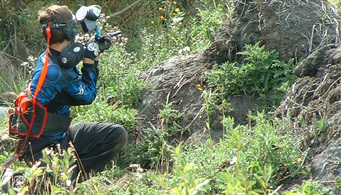 I also have created a new section called "New To Paintball?" this will contain any and all articles specifically relating to those who have never played paintball or want to find out more information about it. I also have added several articles to the Articles page. More news to come! A few articles added in the last few months, fixed the forums. Added a couple more articles check them out. As well as I added a jIRC applet so that you can come join us on #Paintball Undernet on IRC:-) if you have mIRC (http://www.mirc.com/) you can log on to any Undernet server (irc.undernet.org) and join channel #Paintball hope to see you there.